We've included listings for companies such as Deco Design Center and Marvin Windows and Doors inside our French Doors guide. With outlets in White River Junction, VT and Manchester, NH, this company sells historic salvage items such as wrought iron fencing, mantelpieces, french doors and stained glass windows. Site offers many photos and examples of what's for sale. Full line of aluminum-clad wood windows and doors for many architectural styles. This French custom manufacturer offers high-end wood, copper-clad and aluminum-clad windows and doors in the U.S., targeting its products at custom designers and architects. 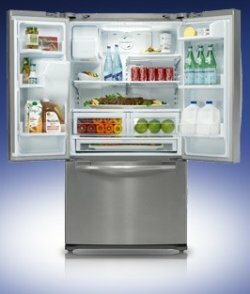 French door refrigerator packs in 29 cubic feet of storage.